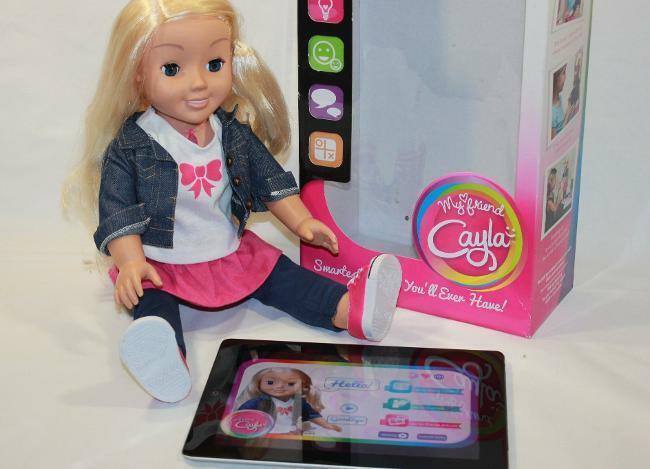 A few weeks ago Cayla was taken out of her box and became part of our doll family. She is now part of the family too! At first I wondered about this "talking" doll and didn't have any high expectations. Well, I was pleasantly surprised! She is a wonderful doll! Once she is out her box she needs some batteries (not included). Easy to pop in her back. Then I downloaded the App onto the family IPad. The instructions were easy to follow and I was able to connect her without any problems. She connects via Blue tooth. The App is really simple to use. My daughter is 5 years old and she navigates it without a problem. Cayla tells stories, you can browse her photo album with her and there are 2 games you can play against her. Her volume can be set in the App as well as how much she speaks. When she first comes on she introduces herself and asks you questions and you can have a conversation with her. She will ask you to ask her a question and we had fun listening to her replies. If your connection is slow then she may take a while to think. I also found that my daughter is a little soft spoken so Cayla did not always understand her. But if my 7 year old or I spoke to her there was no problem. Cayla also has words that are blocked and you can add to that list. We asked "What is a Peacock?" She replied "That is not a nice thing to talk about". She is polite but stern and that is when I realized how well her blocked words worked! She has a fun mix and match outfit. 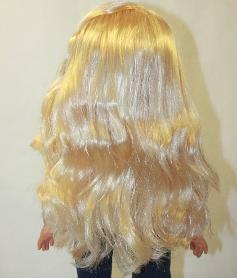 5 Pieces are included - Shirt, leggings, denim jacket, skirt and plastic mold shoes. All are well made and will withstand hours of play. My daughter was able to find clothes in her own cupboard to match her new friend! She also comes with a small brush and hand held mirror. She is well constructed and has a solid body. 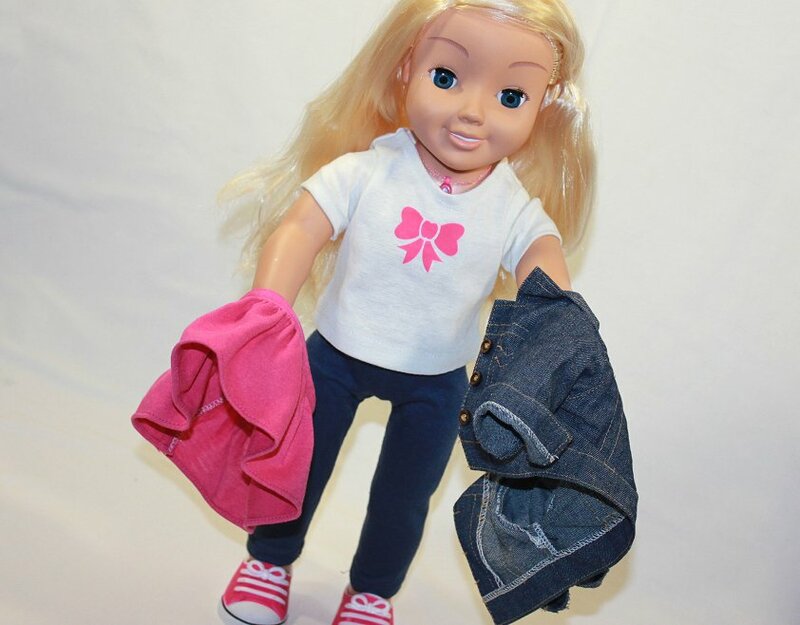 Her arms and legs are very standard 18inch dolls size. She has a cute face with sleep eyes. I found she sits and stands well. Her arms and legs can only move forward and backwards and cannot articulate sideways. Her hair... she has rooted hair. It is pretty and soft. I am not sure what the hair will do with months of playing and brushing so we are keeping ours brushed out and braided to prevent frizz. The little heart in her chest is a light that comes on when she is listening. It is so adorable how they made it look like a charm on a necklace, so she doesn't look like a robot! 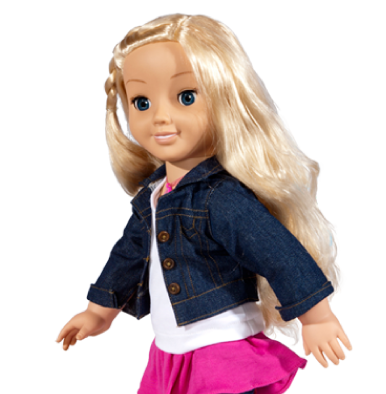 Another awesome feature of Cayla is that she can share clothes, shoes and accessories with other 18 inch dolls! Yes! Even shoes are a perfect match! Her chest is a little thinner than the "stuffed" body 18 inch dolls but her shoulders are a nice width so the clothes still sit well. 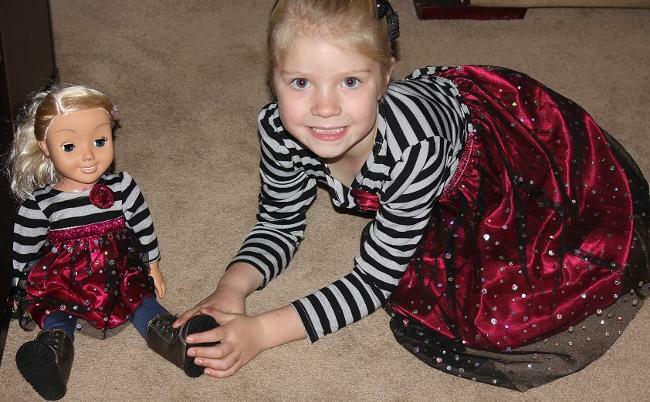 My daughter, Zoe above is having a wonderful time dressing Cayla and dressing like Cayla! 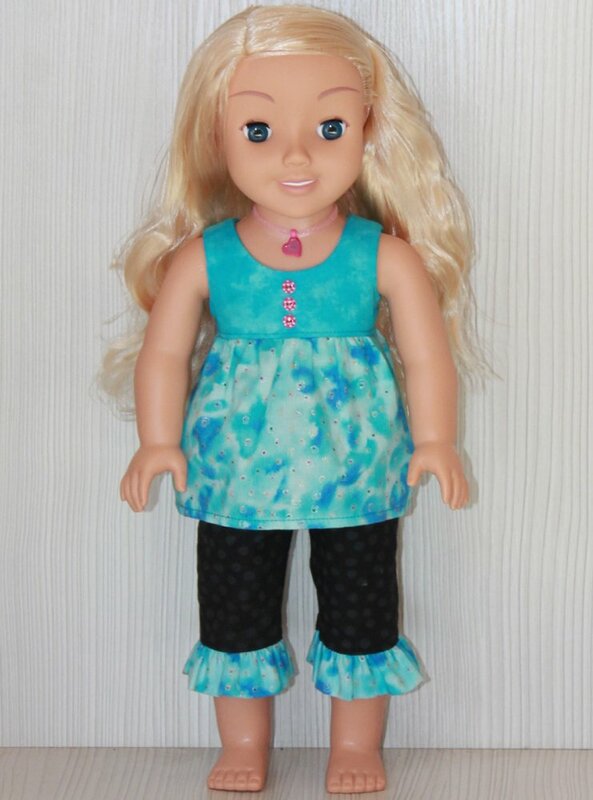 Although Cayla can share clothes with other 18 inch dolls you may want to sew her something that is more fitting and especially for her. There is no other doll like Cayla out there. 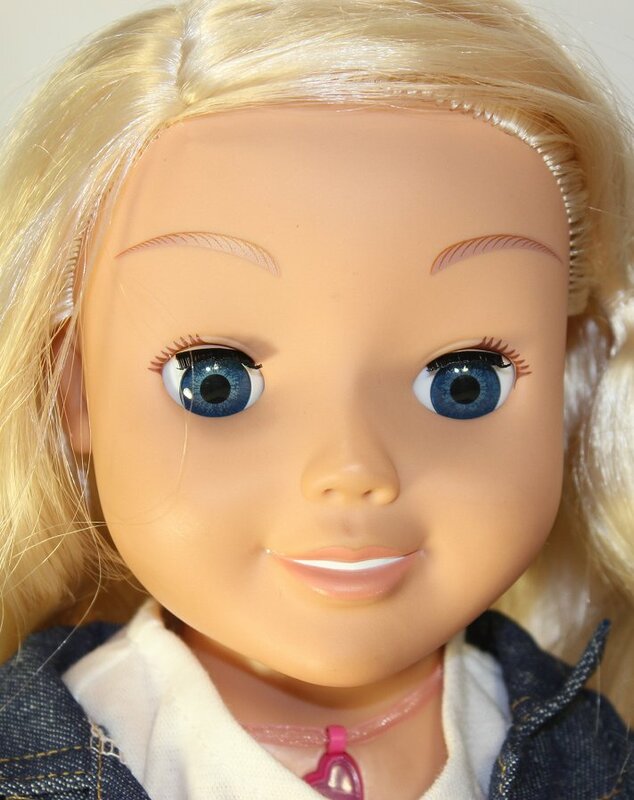 No other doll that talks and even answers questions. She is a wonderful doll to have and my daughter really has spent hours with her. Even without her being on and chatting she enjoys dressing her and playing school with her. Another fun thing is we installed the App onto Granny's IPad as well... so when my daughter goes there for a sleepover she can play with her there as well! Cayla has been available in Europe and South Africa for a few months now and has been tried and tested! She also has all her internet links... be sure to follow her arrival in the USA!